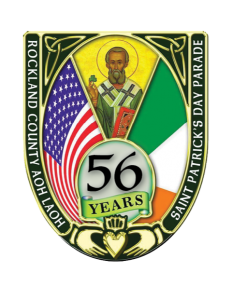 The Rockland County AOH cordially invites you to the 2018 St. Patrick’s Day Parade Mass at Dominican Convent, 175 Route 340, Sparkill, N.Y. on Sunday, March 18, 2018, at 9:00 a.m. The convent is located across the street from Camp Venture. Immediately following the mass, a breakfast will be held at the Pearl River Hilton in Pearl River, N.Y. honoring the Grand Marshal Emmett Woods and his aides. Tickets may be purchased below. Alternatively, you may mail your reservation and a check for $ 35 per person (Children under 7 free) (All Checks should be made payable to RCAOH) toRockland County AOH Emerald Ball Committee, PO Box 182, Pearl River, NY 10965 by March 15, 2018. Due to limited seating arrangements, breakfast reservations will not be accepted at the door! NO EXCEPTIONS WILL BE MADE!!!!! I hope that you will make this a memorable event for Emmett Woods and his aides.